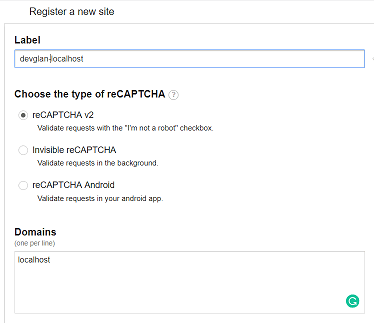 In this article, we will be integrating Google reCaptcha with a spring boot web applications with Angular as a client to protect websites from spam and abuse. 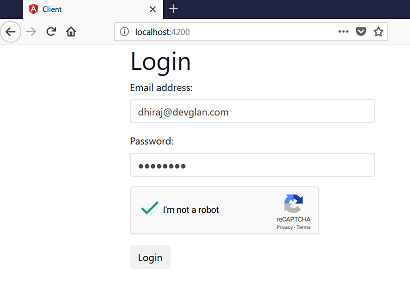 The ReCaptcha will appear in an angular login form and once the form is submitted, it will be validated on the server side with the secret key along with the username and password. In the example, once the user credentials and the captcha is validated, post login page will appear. In my previous articles, we created angular 5 example as well as angular 6 example and integrated JWT token based auth in an angular app. Hence, here we will not be demonstrating JWT integration instead we will be hardcoding the username and password in the backend code as dhiraj@devglan.com and password respectively. We will be generating a sample angular 6 app using angular CLI and for the APIs we will be using existing Spring Boot REST APIs which we have created earlier with little modifications to integrate Google reCaptcha in the server side. Both the CLI and generated project have dependencies that require Node 8.9 or higher, together with NPM 5.5.1 or higher for Angular 6.Angular v6 is the first release of Angular that unifies the Framework, Material and CLI. @angular/core now depends on. Run following command to generate angular 6 project in any location of your choice. The complete step by step instruction is provided in my angular 6 example here. To set up Google ReCaptcha, head over to https://www.google.com/recaptcha/admin and register the site. Following is my screenshot. Now, once you click on the regsiter button, you can see the site key and secret which will be used later for the integration.You can also find all the instructions on this page about integrating Google ReCaptcha with our code.In the screenshot below we can see the sample html and script tag required to place in our code for the client side integration. The secret key will be used in the server side while verifying the captcha with Google API. Following is a normal login page with an extra div element added for ReCaptcha as per the screenshot above. The response string from grecaptcha.getResponse() will be sent to server for further validation.Following is the model class. 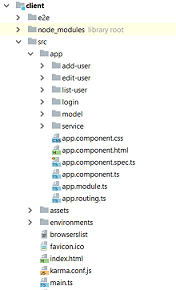 Following is the implementation in our service class at Angular side. Spring boot team has really made spring boot environment setup easy by providing default initializers.Open the url https://start.spring.io/ and generate the project as follow. Now unzip user-portal.zip and import into java IDE. Following will be the final structure. Now, let us start by creating our APIs first.We have UserController where all the APIs for CRUD operation is exposed.The @CrossOrigin is used to allow Cross-Origin Resource Sharing (CORS) so that our angular application running on different server can consume these APIs from a browser. For simplicity I am only including the login API here. 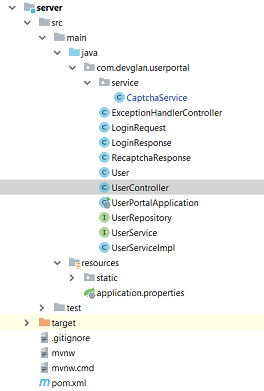 In real time application, we will have an AuthController for performing login. There are many articles posted on Devglan for login auth here. Following is the service class implementation that will actually make DB calls and validate the user credentials along with the captcha. To make the example simple, I have hardcoded the username and password. Here, captchaService is injected as a dependency which will validate the captcha response coming from the client and return either true or false after validation. Following is the screenshot of the Google API response. Below is the implementation of CaptchaService.java that will make a POST request to https://www.google.com/recaptcha/api/siteverify in order to validate the captcha response coming from the client side. Following entries are required in application.properties file that we get from Google ReCatcha during registration. Cross-Origin Resource Sharing (CORS) is a mechanism that uses additional HTTP headers to tell a browser to let a web application running at one origin (domain) have permission to access selected resources from a server at a different origin. Since, we have server running at localhost:8080 and angular running at localhost:4200, we see error as No 'Access-Control-Allow-Origin'. To avoid this error, we can add below filter in the spring project. Once the login is successfull,you can see the list page.